Hardcover, Linen with jacket, 336 pages, 13.5 x 21.5 cm, 5.3 x 8.5 in. It is a well-known fact that fine arts underwent a fundamental change at the beginning of the 20th century. Few people, however, know Marianne von Werefkin (1860-1938) – painter and socialite, member of the Blue Rider Group and one of its leading thinkers. This is a must-read for anyone interested in Expressionist art and its protagonists. 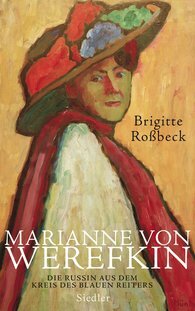 Using the results of extensive research and a wealth of hitherto unknown sources, Brigitte Roßbeck tells here, in this the first comprehensive biography of this painter, the life of an ardent, passionate and witty woman – a woman who risked a lot while at the same time remaining true to herself.